Oh lilacs... how I love you. From your delicate star blossoms to your intoxicating scent and gorgeous colors- you are a spring beauty. 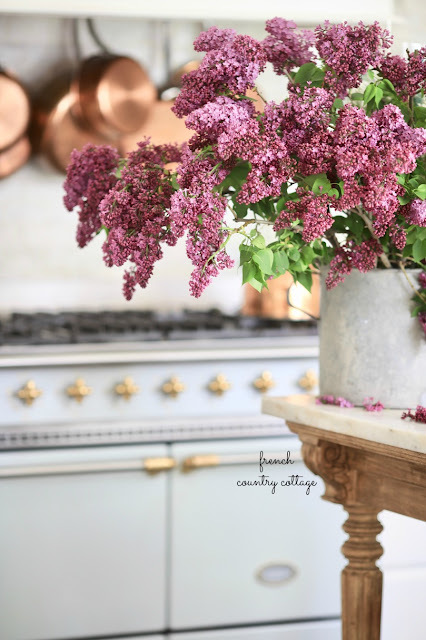 And I am pretty sure that a bucket of lilac on the kitchen island- is exactly perfect. And maybe on the mantel. And in the living room. And on the table too... we will get to this lilac inspired table setting in another post and we could talk about the amazing ways to clip and enjoy these beautiful blooms for hours. They are right up there with peonies, ranunculus and garden roses. 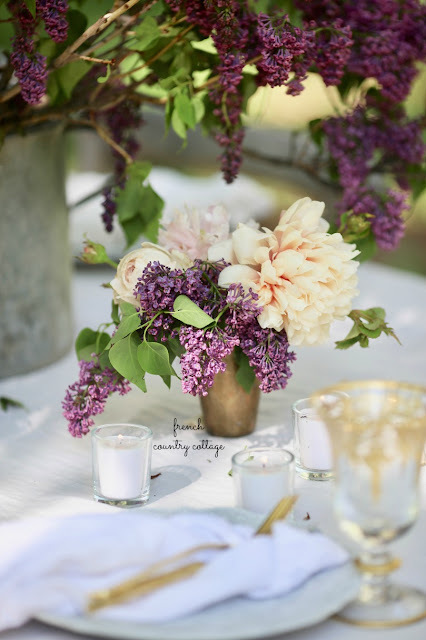 Today it is all about how to cut those lilacs and what to do to help keep them from wilting. 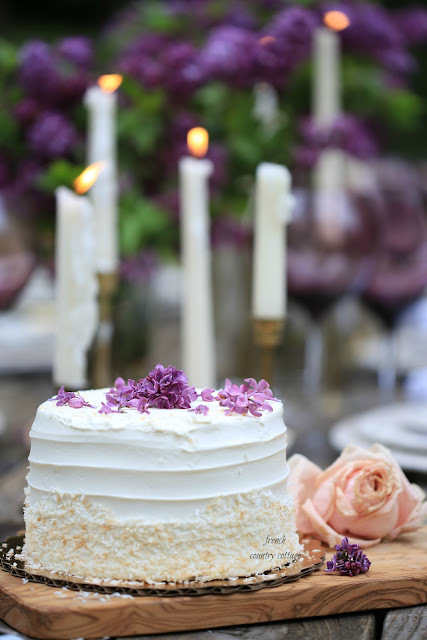 Because, wilted lilacs just aren't the same kind of fabulous. Here are the tips I have and some tips I found while researching more tips. This is a tip I read on a gardening website. I don't always follow the rules... but I do tend to clip flowers in the evenings simply because the light is so pretty I just want to wander in the garden. But I think either morning or evening would be okay- just avoid the midday and the warm sun. As much as we love to feel the warm sun while outside- it is not good for cut flowers and will cause wilting fairly quickly. So just think 'cool' while clipping. I can be honest and tell you that not allllll of my scissors are as sharp as they should be- and when clipping flowers that dullness can cause them to not load up on the water as easily after cutting. So, whenever I am cutting plants with big stems like lilacs- I grab the pruners. Cut the stem on an angle- which will allow more water to be soaked up into the bloom than if you cut it off flat. Then grab your hammer and find a spot like a work bench or piece of old wood and smash the bottom of the stem with the hammer. You want the stem to be 'splintered and split' to really allow those lilacs to drink as much water as they want to all the time. Another option is to 'steam' the stems after cutting. I haven't tried it- but apparently it works well. I am one of those people who likes to see some of the leaves on plants- so I don't always remove as many as I should. But here is the thing to remember about leaves. They need water too. So if you have a ton of leaves on your cut flowers- they will be soaking up some of the good stuff that keeps your blooms happy before it reaches the blooms. So the more leaves you 'leave' on (hahah- I had to do it!) the more water those clippings will drink- and the blooms may not last as long. And by removing the lower leaves- it will help the water to be fresh longer. No pond water brewing in that vase. 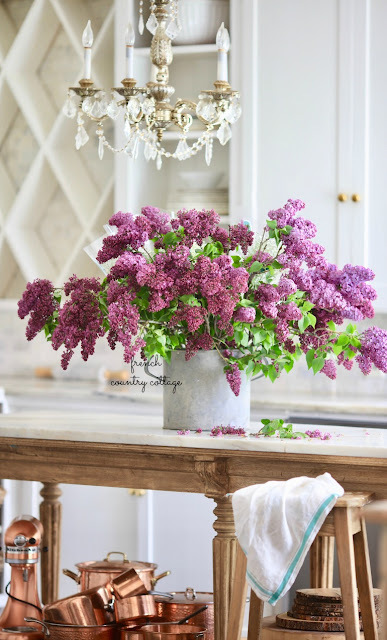 I didn't realize that lilacs had their own type of flower food until I got a bunch of them from the flower market and realized the food looked different. They apparently are picky eaters and do not love the same food that most flowers at the market do- so look for one that says' Syringa' on it if there are options. Otherwise, I would use an everyday readily available flower food- or make your own. I would plan to re-cut and re-smash the stems every few days or when you see a few of the blooms starting to wilt. 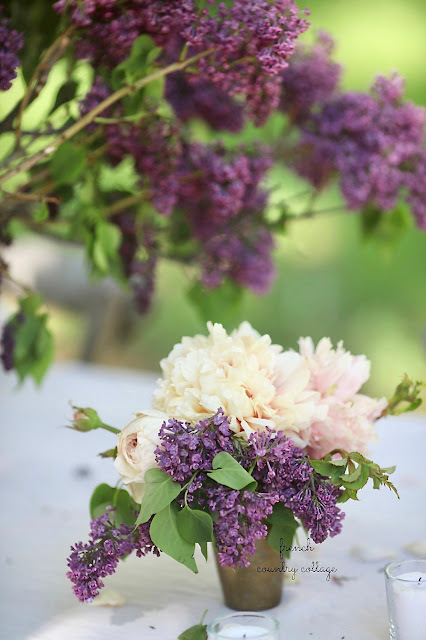 Keep in mind that lilacs like most flowers-don't last weeks and weeks after cutting- but you can keep them looking good longer by these steps above. Lilacs come in various shades and colors. And we have wild lilacs growing all around our property. They smell just as incredible and I do clip them and enjoy them in pots. Their white blooms aren't as 'chunky' as the variety you can find at the market- but they are beautiful even so. 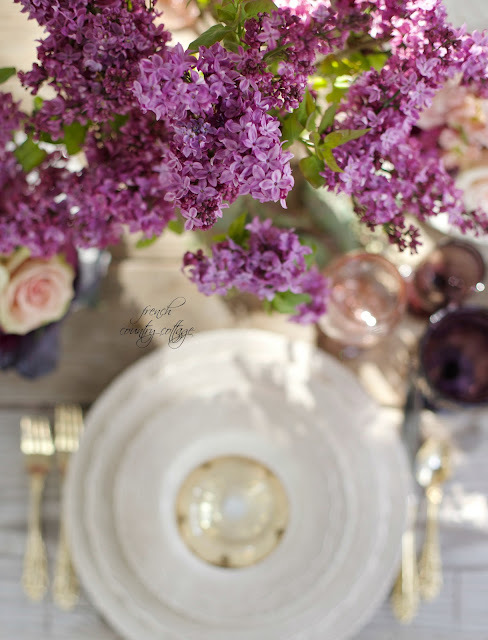 Lilacs are edible plants- and they are medicinal. Read more here. Lilacs have a bit of history that makes you go hmmmm. They used to be considered bad luck or a bad sign when brought indoors and also thought that they represented a woman not finding love and staying single. That changed during Victorian times when Lilac became known as lucky for love with white lilac bringing 'innocence' along with it as well. Lilac are natural astringents and can be mixed together to create a cleanser for your face. Who knew? Basically, here is what I know. Lilacs are amazing. Not just because they are beautiful and full of delicate star shaped blossoms that have the most intricate details. Or that they bring a burst of sunshine into a room- and they fill garden paths with their gorgeous shades of purple in spring signaling that summer is just around the corner. Or even that their scent is absolutely incredible. Of course they are amazing for all of those things though and they are simply beautiful flowers to bring indoors and enjoy. I absolutely love them. And thank you SO much for your notes and kind words on the share about my new book. Excited to share my book cover and new book page with you yesterday and am looking forward to sharing much more with you soon!